Yumi (japanese bow) is exceptionally tall (standing over two meters), surpassing the height of the kyudoka. Yumi are traditionally made of bamboo, wood and leather using techniques which have not changed for centuries, although some archers (particularly, those new to the art) may use synthetic (i.e. laminated wood coated with glassfibeer or carbon fiber) yumi. Even advanced kyudoka may own non-bamboo yumi and ya due to the vulnerability of bamboo equipment to extremes of climate. The suitable height for yumi depends on the archer's draw (yatsuka) which is about half the archer's height. The draw strength varies by gender, age, and experience. For beginners, an adult female typically has an 8 to 14 kg draw strength, while a male is between 10 and 15 kg. 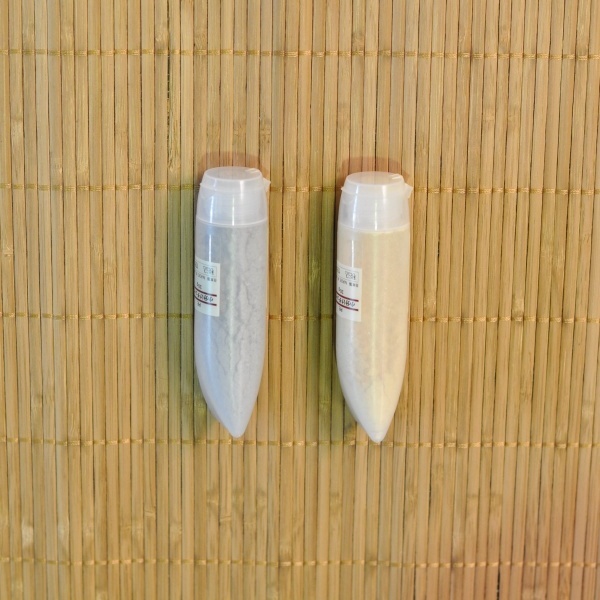 Within a year, with regular practice, practitioners will need a stronger yumi - it is a good idea to use class yumi for the first year for this reason. Females will average between 14 and 16 kg, and males between 18 and 20 kg. Shape of the yumi is asymmetrical; the grip is positioned at about one-third the distance from the lower tip and upper and lower curves differ. Several hypotheses have been offered for this asymmetric shape. 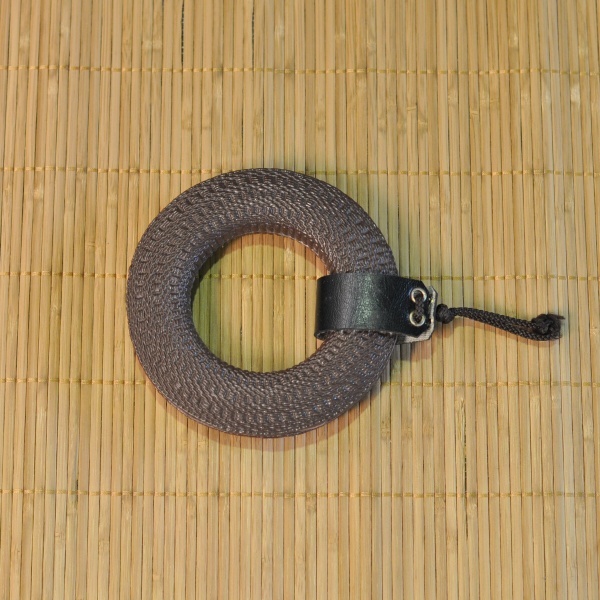 Some believe it was designed for use on a horse, where the yumi could be moved from one side of the horse to the other with ease. Others claim that asymmetry was needed to enable shooting from a kneeling position and yet another explanation is the characteristics of the wood from time before laminating techniques. A well cared-for yumi can last many generations, while the usable life of a mistreated yumi can be very short. Ya (arrow) shafts were traditionally made of bamboo, with either eagle or hawk feathers. Most ya shafts today are still made of bamboo (although some archers will use shafts made of aluminum or carbon fibers), and ya feathers are now obtained from non-endangered birds such as turkeys or swans. The length of an arrow is the archer's yatsuka plus 5-10 centimeters. The type of an arrow depends on draw strenght. Every ya has a gender (male ya are called haya; female ya - otoya); being made from feathers from alternate sides of the bird, the haya spins clockwise upon release while the otoya spins counter-clockwise. Kyudo archers usually shoot two ya per round, with the haya being shot first. 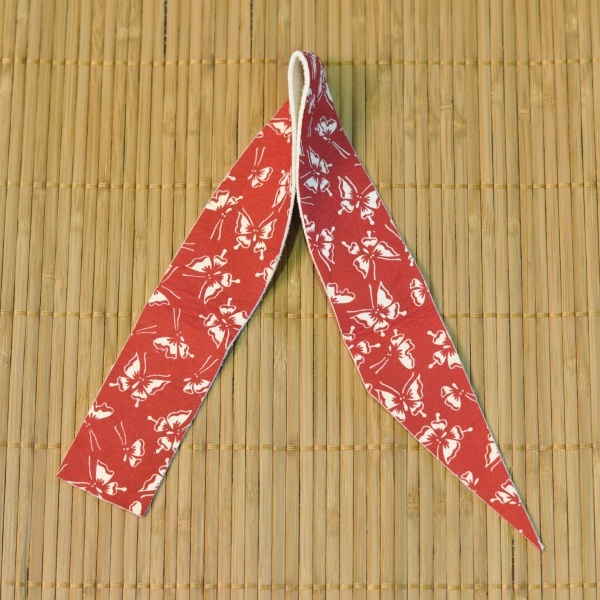 Tsuru (string) of a yumi is traditionally made of hemp or from synthetic materials such as kevlar. 2.0 momei for > 20 kg yumi. Strings are usually not replaced until they break; this results in the yumi flexing in the direction opposite to the way it is drawn, and is considered beneficial to the health of the yumi. The nocking point on the string is built up through the application of hemp and glue to protect the string and to provide a thickness which helps hold the nock of the arrow in place while drawing the yumi. 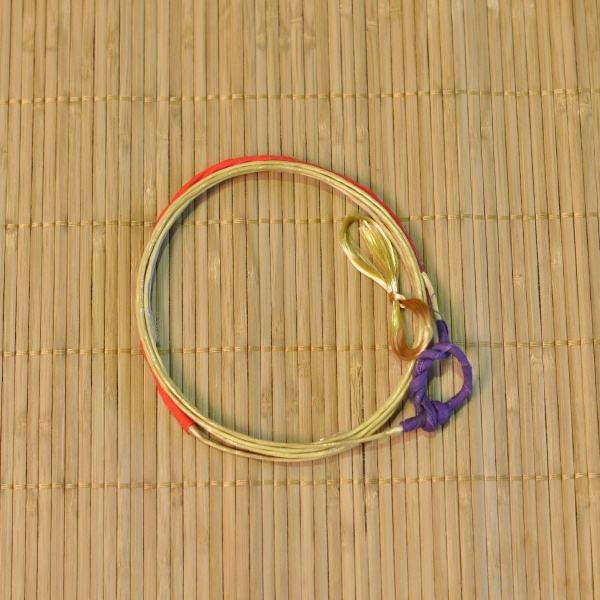 Tsurumaki (literally "bow string roll") is a holder for spare bowstrings. Yugake (glove) is typically made of deerskin with a hardened thumb containing a groove at the base used to pull the tsuru (string). - Morogake- five fingered glove. The practical reasoning for the extra finger on the glove stems from having more surface area available to the archer for the heavier draws. During the draw, the thumb of the archer is typically placed on the last gloved finger of the drawing hand, with the first (or, in the case of a yotsugake, the first and index fingers) being placed gently on either the thumb or the arrow shaft itself. Sometimes a type of resin powder, called giriko is applied to the thumb and holding finger to assist in the grip during the pull. The extra finger allows for a stronger hold on the thumb, as it is then placed on the third finger of the hand as opposed to the second. 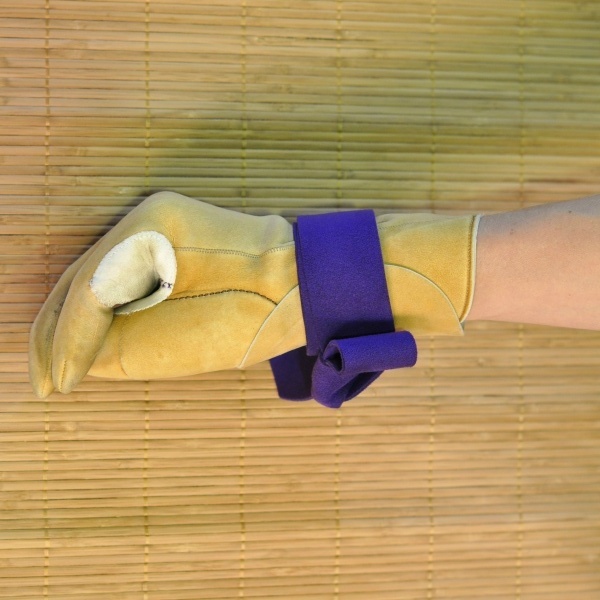 Some schools, such as Heki-ryu Insai-ha only use the three-fingered glove, even with bows above 40 kilograms. 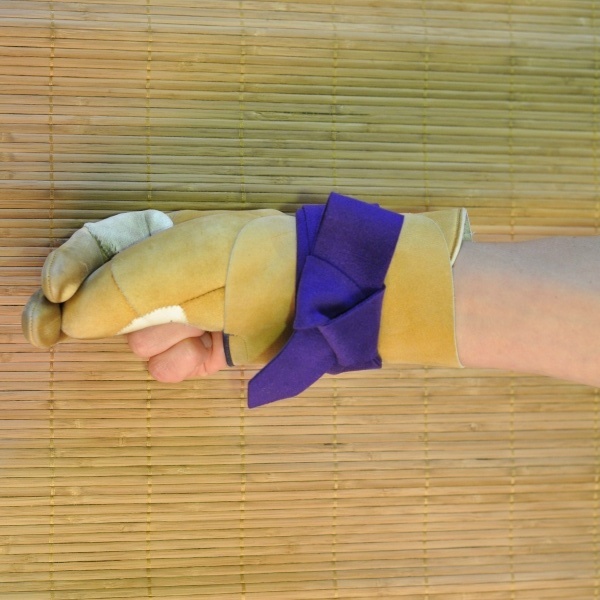 The five-finger glove, called a "morogake" is used almost exclusively by Ogasawara Ryu (a horse archery style) practitioners, and is not typically used in competition or by any other school. Yugake is worn with an underglove called a Shitagake which is made of cotton or synthetic cloth. Because of the unique firing technique of kyudo, protection on the left (bow) arm is not generally required. The bow string, when properly fired, will travel around the bow hand, coming to rest on the outside of the arm. 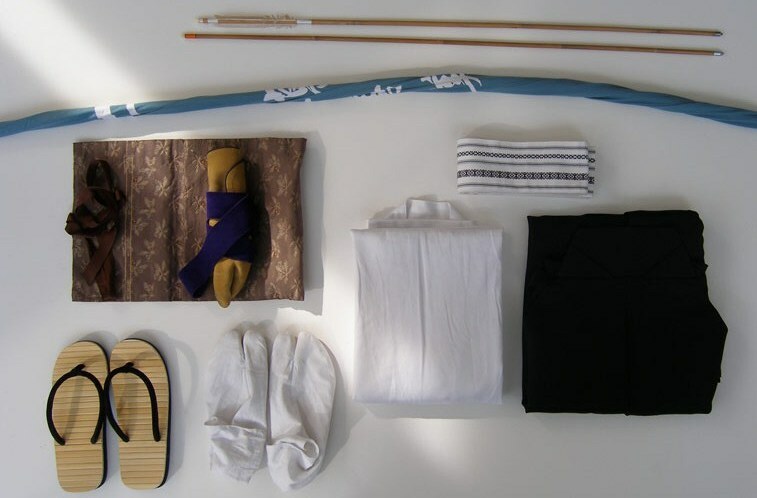 Many archers also have a small container of fudeko and giriko attached to the end of the tsurumaki (string holder) strap; this container is called a "fudeko-ire" (or "giriko-ire") and is traditionally made of horn or antler (though many modern kyudoka have fudeko-ire and giriko-ire made of plastic). - Giriko is a type of rosin that is applied to the thumb of the shooting glove to keep the fingers from slipping during shooting. - Fudeko is made of fine ash and is used to reduce moisture on the hands and grip during shooting. A.N.K.F standards call for all novice practitioners to wear white keiko-gi and tabi. 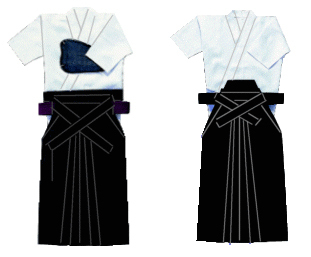 Men must wear black hakama, while women may wear either black or navy blue hakama. It goes without saying that the practice uniform must be kept clean and neatly pressed at all times.